You can view and add Tasks for tickets on the right hand side of the Ticket Detail window for existing tickets. You can also view and manage all of your Tasks from the Task section on the left hand navigation. 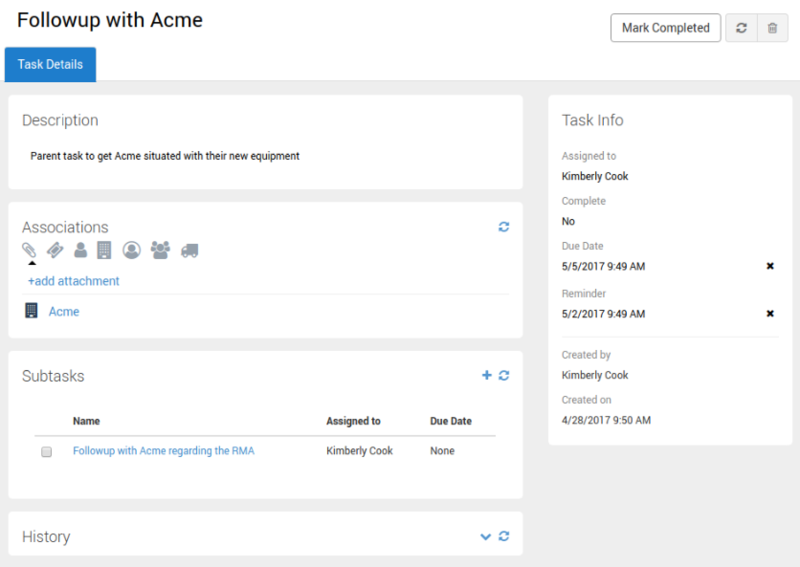 There is also a Task tab for Customers and Contacts, Products, Group, and Users. Tasks can be found on the left hand navigation of your TeamSupport window. Click here to learn about fields found on the main Tasks page. Name: This is the only required field. Similar to tickets, give your Tasks descriptive names so that they are easily identifiable from the grids. This means the assigned user will not have to open the task to understand what it is for. Description: Give your Tasks any additional details in this field. There is a editing toolbar similar to the one found in Ticket actions. For example, you can insert images, Ticket links, along with lots of formatting options. Assigned to: The default assignee will be the user who creates the Task. The assigned user can be changed at any time, and an unassigned user can be selected. Similar to Tickets, unassigned users are useful if a Task need to be made for an entire group, but doesn’t necessarily need to be assigned to a particular user right away. Complete: By checking this box, the Task will be marked as complete. Completed Tasks appear under the “Completed Tasks” tab. Due Date: Due Dates on Tasks help users stick to deadlines. When a Due Date passes, the Task will appear on the grid with a red background. An email also gets sent to the assigned user when a Task becomes due. Tasks with Due Dates appear on the Calendar with purple text. Reminder: Check this box if you would like the assigned user to receive a Reminder for the Task. Reminder Date: The date and time of the Reminder is set using this field. An email will be sent to the assigned user at the Reminder time. Attachment: You may attach a file which is relevant to the Task. Max file size is 25MB. Mark Complete: This button is similar to checking the “Completed” box on the Task grid. By clicking this button, the Task will be marked as complete. Completed Tasks appear under the “Completed Tasks” tab on the Tasks grid. All Subtasks must be complete before a main Task can be marked as complete. Refresh: The refresh button will refresh the current window and bring in any changes that may have been made. Trash can: The Trash can allows you to delete a Task. Deleted Tasks cannot be recovered. Subtasks: You are able to make 1 level deep of Subtasks. This is a great option for a Project Managers, or anyone who would benefit from grouping Tasks together. 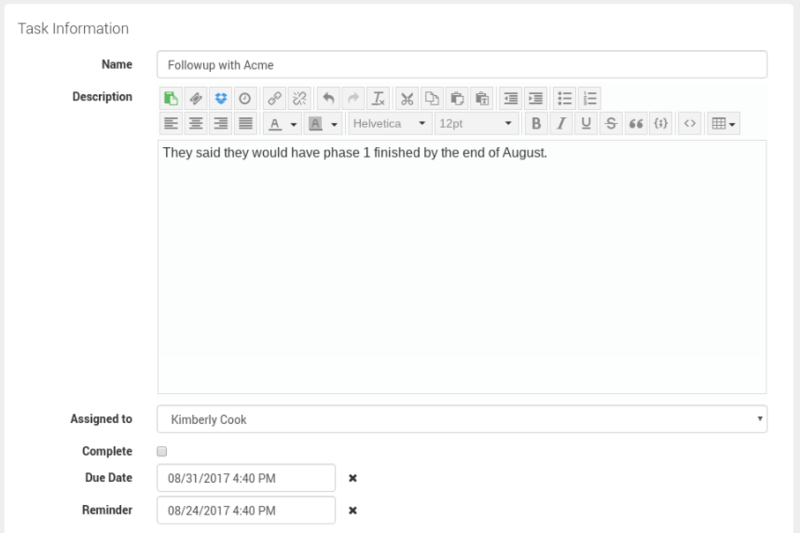 For example, you can create a primary Task for Customer Onboarding, which would have several Subtasks for various meetings, documentation, training, and implementation. All Subtasks must be complete before attempting to mark a main Task as complete. History: All of the actions that are taken on a ticket will be reported in the History section.